Yue, D., Gao, J., Zeng, B., & You, F.* (2019). A projection-based reformulation and decomposition algorithm for global optimization of a class of mixed integer bilevel linear programs. Journal of Global Optimization, 73, 27-57. Ning, C., & You, F.* (2019). Optimization under Uncertainty in the Era of Big Data and Deep Learning: When Machine Learning Meets Mathematical Programming. Computers & Chemical Engineering, 125, 434-448. Shang, C., & You, F.* (2019). A Data-Driven Robust Optimization Approach to Scenario-Based Stochastic Model Predictive Control. Journal of Process Control, 75, 24-39. Ning, C., & You, F.* (2019). Data-Driven Adaptive Robust Unit Commitment under Wind Power Uncertainty: A Bayesian Nonparametric Approach. IEEE Transactions on Power Systems, 34, 2409-2418. Zhao, S., & You, F.* (2019). Resilient Supply Chain Design and Operations with Decision-Dependent Uncertainty using Data-Driven Robust Optimization. AIChE Journal, 3, 1006-1021. Gao, J., Ning, C., & You, F.* (2019). Data-Driven Distributionally Robust Optimization for Shale Gas Supply Chain Design and Operations under Uncertainty. AIChE Journal, 3, 947-963. Zhao, S., & You, F.* (2019). Comparative Life Cycle Assessment of Li-ion Batteries through Process-based and Integrated Hybrid Approaches. ACS Sustainable Chemistry & Engineering, 7, 5082–5094. Gao, J., & You, F.* (2019). A Stochastic Game Theoretic Framework for Decentralized Optimization of Multi-Stakeholder Supply Chains under Uncertainty. Computers & Chemical Engineering, 122, 31-46. Lee, I., & You, F.* (2019). Systems design and analysis of liquid air energy storage from liquefied natural gas cold energy. Applied Energy, 242, 168-180. Lee, I., Park, J., You, F.*, & Moon, I. * (2019). A novel cryogenic energy storage system with LNG direct expansion regasification: Design, energy optimization, and exergy analysis. Energy, 173, 691-705. Park, J., Lee, I., You, F.*, & Moon, I. * (2019). Economic process selection of LNG regasification: power generation and energy storage applications.Industrial & Engineering Chemistry Research, 58, 4946–4956. Garcia, D.J., Mozaffar, M., Ren, H., Correa, J.E., Ehmann, K., Cao, J., & You, F. (2019). Repairing Automotive Dies with Directed Energy Deposition: Industrial Application and Life Cycle Analysis . Journal of Manufacturing Science and Engineering, 141, 021019. Bennett, J.L., Garcia, D.J., Kendrick, M., Hartman, T., Hyatt, G., Ehmann, K., You, F., & Cao, J.; (2019). Sustainable Manufacturing with Cyber-physical Manufacturing Networks: Overview and Modeling Framework. Journal of Manufacturing Science and Engineering, 141, 021013. Masnadi, M.S., El-Houjeiri, H.M., Schunack, D., Li, Y., Englander, J.G., Badahdah, A., Monfort, J.-C., Anderson, J.E., Wallington, T.J., Bergerson, J.A., Gordon, D., Koomey, J., Przesmitzki, S., Azevedo, I.L., Bi, X.T., Duffy, J.E., Heath, G.A., Keoleian, G.A., McGlade, C., Meehan, D.N., Yeh, S., You, F., Wang, M.Q., Brandt, A.R. (2018). Global carbon intensity of crude oil production. Science, 361, 851-853. Gao, J., & You, F.* (2018). Dynamic Material Flow Analysis-Based Life Cycle Optimization Framework and Application to Sustainable Design of Shale Gas Energy Systems. ACS Sustainable Chemistry & Engineering, 6, 11734–11752. Gong, J., & You, F.* (2018). Resilient Design and Operations of Process Systems: Nonlinear Adaptive Robust Optimization Model and Algorithm for Resilience Analysis and Enhancement. Computers & Chemical Engineering, 116, 231-252. Ning, C., & You, F.* (2018). Data-Driven Stochastic Robust Optimization: General Computational Framework and Algorithm Leveraging Machine Learning for Optimization under Uncertainty in the Big Data Era. Computers & Chemical Engineering, 111, 115-133. Liang, Y., Hui, C.W., & You, F.* (2018). Multi-Objective Economic-Resource-Production Optimization of Sustainable Organic Mixed Farming Systems with Nutrient Recycling. Journal of Cleaner Production, 196, 304-330. Yang, M., & You, F.* (2018). Modular Methanol Manufacturing from Shale Gas: Techno-economic and Environmental Analyses of Conventional Large-scale Production versus Small-scale Distributed, Modular Processing. AIChE Journal, 2, 495–510. Ning, C. & You, F.* (2018). Data-Driven Decision Making under Uncertainty Integrating Robust Optimization with Principal Component Analysis and Kernel Smoothing Methods. Computers & Chemical Engineering, 112, 190–210. Gong, J., & You, F.* (2018). A New Superstructure Optimization Paradigm for Process Synthesis with Product Distribution Optimization: Application to An Integrated Shale Gas Processing and Chemical Manufacturing Process. AIChE Journal, 64, 123–143. Shang, C., & You, F.* (2018). Distributionally Robust Optimization for Planning and Scheduling under Uncertainty. Computers & Chemical Engineering, 110, 53–68. Garcia, D.J., & You, F.* (2018). Addressing Global Environmental Impacts Including Land Use Change in Life Cycle Optimization: Studies on Biofuels. Journal of Cleaner Production, 182, 313–330. Zhou, H., Xie, T., & You, F.* (2018).On-line Simulation and Optimization of A Commercial-Scale Shell Entrained-flow Gasifier Using a Novel Dynamic Reduced Order Model. Energy, 149, 516–534. Tang, Y., & You, F.* (2018). Multi-criteria Environmental and Economic Analysis of Municipal Solid Waste Incineration Power Plant with Carbon Capture and Separation from the Life Cycle Perspective. ACS Sustainable Chemistry & Engineering, 6, 937–956. Ning, C., & You, F.* (2018). Adaptive Robust Optimization with Minimax Regret Criterion: Multiobjective Optimization Framework and Computational Algorithm for Planning and Scheduling under Uncertainty. Computers & Chemical Engineering, 108, 425-447. Cao, Z., Tao, L., Zhang, Q., Zhou, H.*, Song, C., & You, F.* (2018). Systems Modeling, Simulation and Analysis for Robust Operations and Improved Design of Entrained-flow Pulverized Coal Gasifiers. Energy, 148, 941-964. Tang, Y, & You, F.* (2018). Life Cycle Environmental and Economic Analysis of Pulverized Coal Oxy-fuel Combustion Combining with Calcium Looping Process or Chemical Looping Air Separation. Journal of Cleaner Production, 181, 271-292. Zhou, H., Cai, Y., & You, F.* (2018). Systems Design, Modeling, and Thermo-Economic Analysis of Azeotropic Distillation Processes for Organic Waste Treatment and Recovery in Nylon Plants. Industrial & Engineering Chemistry Research, 57, 9994–10010. He, C., Pan, M., Zhang, B., Chen, Q., You, F. & Ren, J. (2018). Monetizing Shale Gas to Polymers under Mixed Uncertainty: Stochastic Modeling and Likelihood Analysis. AIChE Journal, 64, 2017-2036. López-DíazLuis, D.C., Lira-Barragán, F., Rubio-Castro, E., You, F., & Ponce-Ortega, J.M. (2018). Optimal design of water networks for shale gas hydraulic fracturing including economic and environmental criteria. Clean Technologies and Environmental Policy, 20, 2311–2332. Ning, C., & You, F.* (2017). Data-Driven Adaptive Nested Robust Optimization: General Modeling Framework and Efficient Computational Algorithm for Decision Making under Uncertainty. AIChE Journal, 63, 3790–3817. Shang, C., Huang, X., & You, F.* (2017). Data-Driven Robust Optimization Based on Kernel Learning. Computers & Chemical Engineering, 106, 464–479. Ning, C., & You, F.* (2017). A Data-Driven Multistage Adaptive Robust Optimization Framework for Planning and Scheduling under Uncertainty. AIChE Journal, 63, 4343–4369. Gao, J., & You, F.* (2017). Can Modular Manufacturing Be the Next Game-Changer in Shale Gas Supply Chain Design and Operations for Economic and Environmental Sustainability? ACS Sustainable Chemistry & Engineering, 5, 10046–10071. Gao, J., & You, F.* (2017). Modeling Framework and Computational Algorithm for Hedging Against Uncertainty in Sustainable Supply Chain Design using Functional-Unit-Based Life Cycle Optimization. Computers & Chemical Engineering, 107, 221-236. Gao, J., & You, F.* (2017). Design and Optimization of Shale Gas Energy Systems: Overview, Research Challenges, and Future Directions. Computers & Chemical Engineering, 106, 699-718. Gong, J., & You, F.* (2017). Consequential Life Cycle Optimization: General Conceptual Framework and Application to Algal Renewable Diesel Production. ACS Sustainable Chemistry & Engineering, 5, 5887–5911. Garcia, D.J., & You, F.* (2017). Systems engineering opportunities for agricultural and organic waste management in the food–water–energy nexus. Current Opinion in Chemical Engineering, 18, 23–31. Gong, J., Yang, M., & You, F.* (2017). A Systematic Simulation-based Process Intensification Method for Shale Gas Processing and NGLs Recovery Process Systems under Uncertain Feedstock Compositions. Computers & Chemical Engineering, 105, 259-275. Chung, Y.G., Bai, P., Haranczyk, M., Leperi, K., Li, P., Zhang, H., Wang, T.C., Duerinck, T., You, F., Hupp, J.T., Farha, O.K., Siepmann, I. & Snurr, R.Q. (2017). Computational Screening of Nanoporous Materials for Hexane and Heptane Isomer Separation. Chemistry of Materials, 29, 6315–6328. Gao, J., & You, F.* (2017). Game Theory Approach to Optimal Design of Shale Gas Supply Chains with Consideration of Economics and Life Cycle Greenhouse Gas Emissions. AIChE Journal, 63, 2671–2693. Gao, J., & You, F.* (2017). Economic and Environmental Life Cycle Optimization of Noncooperative Supply Chains and Product Systems: Modeling Framework, Mixed-Integer Bilevel Fractional Programming Algorithm, and Shale Gas Application. ACS Sustainable Chemistry & Engineering, 5, 3362–3381. Gong, J., & You, F.* (2017). Optimal processing network design under uncertainty for producing fuels and value-added bioproducts from microalgae: Two-stage adaptive robust mixed integer fractional programming model and computationally efficient solution algorithm. AIChE Journal, 63, 582–600. Yue, D., & You, F.* (2017). Stackelberg-Game-Based Modeling and Optimization for Supply Chain Design and Operations: A Mixed Integer Bilevel Programming Framework. Computers & Chemical Engineering, 102, 81–95. Chung, Y.G., Gómez-Gualdrón, D.A., Li, P., Leperi, K., Deria, P., Zhang, H., Vermeulen, N.A., Stoddart, J.F., You, F., Hupp, J.T., Farha, O.K., & Snurr, R.Q. (2016). In silico discovery of metal-organic frameworks for pre-combustion CO2 capture using a genetic algorithm. Science Advances, 2, e1600909. Shi, H., & You, F.* (2016). Energy Optimization of Water Supply System Scheduling: Novel MINLP Model and Efficient Global Optimization Algorithm. AIChE Journal, 62, 4277–4296. Yue, D., & You, F.* (2016). Optimal supply chain design and operations under multi-scale uncertainties: Nested stochastic robust optimization modeling framework and solution algorithm. AIChE Journal, 62, 3041–3055. Garcia, D.J., & You, F.* (2016). The Water-Energy-Food Nexus and Process Systems Engineering: A New Focus. Computers & Chemical Engineering, 91, 49–67. He, C., & You, F.* (2016). Deciphering the true life cycle environmental impacts and costs of the mega-scale shale gas-to-olefins projects in the United States. Energy & Environmental Science, 9, 820-840. Yue, D., Pandya, S., & You, F.* (2016). Integrating Hybrid Life Cycle Assessment with Multiobjective Optimization: A Modeling Framework. Environmental Science & Technology, 50, 1501–1509. Shi, H., & You, F.* (2016). A computational framework and solution algorithms for two-stage adaptive robust scheduling of batch manufacturing processes under uncertainty. AIChE Journal, 62, 687–703. Ye, W., & You, F.* (2016). A Computationally Efficient Simulation-based Optimization Method with Region-wise Surrogate Modeling for Stochastic Inventory Management of Supply Chains with General Network Structures. Computers & Chemical Engineering, 87, 164–179. Leperi, K., Snurr, R.Q. & You, F.* (2016). Optimization of Two-Stage Pressure/Vacuum Swing Adsorption with Variable Dehydration Level for Post-Combustion Carbon Capture. Industrial & Engineering Chemistry Research, 55, 3338–3350. Yue, C, You, F., & Huang, Y. (2016). Thermal and economic analysis of an energy system of an ORC coupled with vehicle air conditioning. International Journal of Refrigeration, 64, 152–167. Gong, J., & You, F.* (2015). Sustainable Design and Synthesis of Energy Systems. Current Opinion in Chemical Engineering, 10, 77-86. Chu, Y., & You, F.* (2015). Model-based integration of control and operations: Overview, challenges, advances, and opportunities. Computers & Chemical Engineering, 83, 2-20. Garcia, D.J., & You, F.* (2015). Supply Chain Design and Optimization: Challenges and Opportunities. Computers & Chemical Engineering, 81, 153-170. Gao, J., & You, F.* (2015). Deciphering and handling uncertainty in shale gas supply chain design and optimization: Novel modeling framework and computationally efficient solution algorithm. AIChE Journal, 61, 3739-3755. Shi, H., & You, F.* (2015). A Novel Adaptive Surrogate Modeling based Algorithm for Simultaneous Optimization of Sequential Batch Process Scheduling and Dynamic Operations. AIChE Journal, 61, 4191-4209. Gao, J., & You, F.* (2015). Shale Gas Supply Chain Design and Operations towards Better Economic and Life Cycle Environmental Performance: MINLP Model and Global Optimization Algorithm. ACS Sustainable Chemistry & Engineering, 3, 1282-1291. Yue, D., Gong, J., & You, F.* (2015). Synergies between Geological Sequestration and Microalgae Biofixation for Greenhouse Gas Abatement: Life Cycle Design of Carbon Capture, Utilization, and Storage Supply Chains. ACS Sustainable Chemistry & Engineering, 3, 841-861. Garcia, D.J., & You, F.* (2015). Network-based Life Cycle Optimization of the Net Atmospheric CO2-eq Ratio (NACR) of Fuels and Chemicals Production from Biomass. ACS Sustainable Chemistry & Engineering, 3, 1732-1744. Gong, J., & You, F.* (2015). Value-Added Chemicals from Microalgae: Greener, More Economical, or Both? ACS Sustainable Chemistry & Engineering, 3, 82-96. He, C., & You, F.* (2015). Towards More Cost-Effective and Greener Chemicals Production from Shale Gas by Integrating with Bioethanol Dehydration: Novel Process Design and simulation-based Optimization. AIChE Journal, 61, 1209-1232. Chu, Y., You, F.*, Wassick, J.M., & Agarwal, A. (2015). Simulation-based optimization framework for multi-echelon inventory systems under uncertainty. Computers & Chemical Engineering, 73, 1-16. Shi, H., Chu, Y., & You, F.* (2015). Novel Optimization Model and Efficient Solution Method for Integrating Dynamic Optimization with Process Operations of Continuous Manufacturing Processes. Industrial & Engineering Chemistry Research, 54, 2167-2187. Chu, Y., You, F.*, Wassick, J.M., & Agarwal, A. (2015). Integrated planning and scheduling under production uncertainties: Bi-level model formulation and hybrid solution method. Computers & Chemical Engineering, 72, 255-272. Yue, D., You, F.*, & Snyder, S.W. (2014). Biomass-to-Bioenergy and Biofuel Supply Chain Optimization: Overview, Key Issues and Challenges. Computers & Chemical Engineering, 66, 36-56. Gong, J., & You, F.* (2014). Global Optimization for Sustainable Design and Synthesis of Algae Processing Network for CO2 Mitigation and Biofuel Production using Life Cycle Optimization. AIChE Journal, 60, 3195-3210. Yue, D., & You, F.* (2014). Fair Profit Allocation in Supply Chain Optimization with Transfer Price and Revenue Sharing: MINLP Model and Algorithm for Cellulosic Biofuel Supply Chains. AIChE Journal, 60, 3211-3229. He, C., & You, F.* (2014). Shale gas processing integrating with ethylene production: Novel process designs, exergy analysis, and techno-economic analysis. Industrial & Engineering Chemistry Research, 53, 11442-11459. Yue, D., & You, F.* (2014). Game-Theoretic Modeling and Optimization of Multi-echelon Supply Chain Design and Operation under Stackelberg Game and Market Equilibrium. Computers & Chemical Engineering, 71, 347-361. Chu, Y., & You, F.* (2014). Moving horizon approach of integrating scheduling and control for sequential batch processes. AIChE Journal, 60, 1654-1671. Zhong, Z., & You, F.* (2014). Globally Convergent Exact and Inexact Parametric Algorithms for Solving Large-Scale Mixed-Integer Fractional Programs and Applications in Process Systems Engineering. Computers & Chemical Engineering, 61, 90-101. Gong, J., & You, F.* (2014). Optimal design and synthesis of algal biorefinery processes for biological carbon sequestration and utilization with zero direct greenhouse gas emissions: MINLP model and global optimization algorithm. Industrial & Engineering Chemistry Research, 53, 1563-1579. Chu, Y., & You, F.* (2014). Integrated planning, scheduling, and dynamic optimization for batch processes: MINLP model formulation and efficient solution methods via surrogate modeling. Industrial & Engineering Chemistry Research, 53, 13391-13411. Chu, Y., & You, F.* (2014). Integrated scheduling and dynamic optimization by Stackelberg game: Bi-level model formulation and efficient solution algorithm. Industrial & Engineering Chemistry Research, 53, 5564-5581. Yue, D., Slivinsky, M., Sumpter, J., & You, F.* (2014). Sustainable design and operation of cellulosic bio-electricity supply chain networks with life cycle economic, environmental and social optimization. Industrial & Engineering Chemistry Research, 53, 4008-4029. Chu, Y., You, F.*, & Wassick, J.M. (2014). Hybrid method integrating agent-based modeling and heuristic tree search for scheduling of complex batch processes. Computers & Chemical Engineering, 60, 277-296. Tong, K., Gong, J., Yue, D., & You, F.* (2014). Stochastic Programming Approach to Optimal Design and Operations of Integrated Hydrocarbon Biofuel and Petroleum Supply Chains. ACS Sustainable Chemistry & Engineering, 2, 49-61. Zhang, Q., Gong, J., Skwarczek, M., Yue, D., & You, F.* (2014). Sustainable Process Design and Synthesis of Hydrocarbon Biorefinery through Fast Pyrolysis and Hydroprocessing. AIChE Journal, 60, 980-994. Tong, K., Gleeson, M.J., Rong, G., & You, F.* (2014). Optimal design of advanced ‘drop-in’ hydrocarbon biofuel supply chain integrating with existing petroleum refineries under uncertainty. Biomass & Bioenergy, 60, 108-120. Wu, D., Yue, D., You, F., & Broadbelt, L.J. (2014). Computational Evaluation of Factors Governing Catalytic 2-Keto Acid Decarboxylation. Journal of Molecular Modeling, 20, 2310. He, C., You, F., & Feng, X. (2014). A novel hybrid feedstock to liquids and electricity process: Process modeling and exergoeconomic life cycle optimization. AIChE Journal, 60, 3739-3753. Singh, A., Chu, Y., & You, F.* (2014). Biorefinery Supply Chain Network Design under Competitive Feedstock Markets: An Agent-Based Simulation and Optimization Approach. Industrial & Engineering Chemistry Research, 53, 15111-15126. Tong, K., You, F.*, & Rong, G. (2014). Robust design and operations of hydrocarbon biofuel supply chain integrating with existing petroleum refineries considering unit cost objective. Computers & Chemical Engineering, 68, 128-139. Chu, Y., & You, F.* (2013). Integration of Scheduling and Dynamic Optimization of Batch Processes under Uncertainty: Two-stage Stochastic Programming Approach and Enhanced Generalized Benders Decomposition Algorithm. Industrial & Engineering Chemistry Research, 52, 16851-16869. Yue, D., Kim, M.A., & You, F.* (2013). Design of Sustainable Product Systems and Supply Chains with Life Cycle Optimization Based on Functional Unit: General Modeling Framework, Mixed-Integer Nonlinear Programming Algorithms and Case Study on Hydrocarbon Biofuels. ACS Sustainable Chemistry & Engineering, 1, 1003-1014. Darling, S.B., & You, F. (2013). The case for organic photovoltaics. RSC Advances, 3, 17633-17648. Gebreslassie, B.H., Waymire, R., & You, F.* (2013). Sustainable Design and Synthesis of Algae-Based Biorefinery for Simultaneous Hydrocarbon Biofuel Production and Carbon Sequestration. AIChE Journal, 59, 1599-1621. Wang, B., Gebreslassie, B.H., & You, F.* (2013). Sustainable Design and Synthesis of Hydrocarbon Biorefinery via Gasification Pathway: Integrated Life Cycle Assessment and Technoeconomic Analysis with Multiobjective Superstructure Optimization. Computers & Chemical Engineering, 52, 55-76. Gebreslassie, B.H., Slivinsky, M., Wang, B., & You, F.* (2013). Life Cycle Optimization for Sustainable Design and Operations of Hydrocarbon Biorefinery via Fast Pyrolysis, Hydrotreating and Hydrocracking. Computers & Chemical Engineering, 50, 71-91. Yue, D., & You, F.* (2013). Sustainable Scheduling of Batch Processes under Economic and Environmental Criteria with MINLP Models and Algorithms. Computers & Chemical Engineering, 54, 44-59. Chu, Y., & You, F.* (2013). Integration of production scheduling and dynamic optimization for multi-product CSTRs: Generalized Benders decomposition coupled with global mixed-integer fractional programming. Computers & Chemical Engineering, 58, 315-333. Chu, Y., & You, F.* (2013). Integrated Scheduling and Dynamic Optimization of Complex Batch Processes with General Network Structure Using a Generalized Benders Decomposition. Industrial & Engineering Chemistry Research, 52, 7867-7885. Chu, Y., & You, F.* (2013). Integrated scheduling and dynamic optimization of sequential batch processes with online implementation. AIChE Journal, 59, 2379-2406. Chu, Y., Wassick, J.M., & You, F.* (2013). Efficient scheduling method of complex batch processes with general network structure via agent-based modeling. AIChE Journal, 59, 2884–2906. Yue, D., Guillén-Gosálbez, G., & You, F.* (2013). Global optimization of large-scale mixed-integer linear fractional programming problems: A reformulation-linearization method and process scheduling applications. AIChE Journal, 59, 4255-4272. You, F., & Grossmann, I.E. (2013). Multi-cut Benders Decomposition Algorithm for Process Supply Chain Planning under Uncertainty. Annals of Operations Research, 210, 191–211. Wassick, J.M., Agarwal, A., Akiya, N., Ferrio, J., Bury, S., & You, F. (2012). Addressing the Operational Challenges in the Development, Manufacture, and Supply of Advanced Materials and Performance Products. Computers & Chemical Engineering, 47, 157–169. Chu, Y., & You, F.* (2012). Integration of scheduling and control with online closed-loop implementation: Fast computational strategy and large-scale global optimization algorithm. Computers & Chemical Engineering, 47, 248-268. Gebreslassie, B.H., Yao, Y., & You, F.* (2012). Design under Uncertainty of Hydrocarbon Biorefinery Supply Chains: Multiobjective Stochastic Programming Models, Decomposition Algorithm and A Comparison between CVaR and Downside Risk. AIChE Journal, 58, 2155-2179. You, F.*, & Wang, B. (2011). Life Cycle Optimization of Biomass-to-Liquids Supply Chains with Distributed-Centralized Processing Networks. Industrial & Engineering Chemistry Research, 50, 10102–10127. Zhong, Z., & You, F.* (2011). Oil Spill Response Planning with Consideration of Physicochemical Evolution of the Oil Slick: A Multiobjective Optimization Approach. Computers & Chemical Engineering, 35, 1614–1630. You, F.*, & Leyffer, S. (2011). Mixed-Integer Dynamic Optimization for Oil Spill Response Planning with Integration of A Dynamic Oil Weathering Model. AIChE Journal, 57, 3555-3564. You, F., Grossmann, I.E., & Wassick, J.M. (2011). Multisite Capacity, Production and Distribution Planning with Reactor Modifications: MILP Model, Bilevel Decomposition Algorithm vs. Lagrangean Decomposition Scheme. Industrial & Engineering Chemistry Research, 50, 4831–4849. You, F., & Grossmann, I.E. (2011). Stochastic Inventory Management for Tactical Process Planning under Uncertainties: MINLP Model and Algorithms. AIChE Journal, 57, 1250-1277. You, F., Pinto, J.M., Capon, E., Grossmann, I.E., Arora, N., & Megan, L. (2011). Optimal Distribution-Inventory Planning of Industrial Gases: I. Fast Computational Strategies for Large-Scale Problems. Industrial & Engineering Chemistry Research, 50, 2910-2927. You, F., Pinto, J.M., Grossmann, I.E., & Megan, L. (2011). Optimal Distribution-Inventory Planning of Industrial Gases: II. MINLP Models and Algorithms for Stochastic Cases. Industrial & Engineering Chemistry Research, 50, 2928-2945. You, F., & Grossmann, I.E. (2011). Balancing Responsiveness and Economics in the Design of Responsive Process Supply Chains with Multi-Echelon Stochastic Inventory. AIChE Journal, 57, 178-192. You, F., & Grossmann, I.E. (2010). Integrated Multi-Echelon Supply Chain Design with Inventories under Uncertainty: MINLP Models, Computational Strategies. AIChE Journal, 56, 419-440. You, F., Castro, P.M., & Grossmann, I.E. (2009). Dinkelbach’s algorithm as an efficient method to solve a class of MINLP models for large-scale cyclic scheduling problems. Computers & Chemical Engineering, 33, 1879-1889. You, F., Wassick, J.M., & Grossmann, I.E. (2009). Risk Management for Global Supply Chain Planning under Uncertainty: Models and Algorithms. AIChE Journal, 55, 931-946. You, F., & Grossmann, I.E. (2008). Mixed-Integer Nonlinear Programming Models and Algorithms for Large-Scale Supply Chain Design with Stochastic Inventory Management. Industrial & Engineering Chemistry Research, 47, 7802-7817. You, F., & Grossmann, I.E. (2008). Design of Responsive Supply Chains under Demand Uncertainty. Computers & Chemical Engineering, 32, 3090-3111. Yu, Y.-X., You, F., Tang, Y.-P., Gao, G.-H., & Li, Y.-G. (2006). Structure and Adsorption of A Hard-Core Multi-Yukawa Fluid Confined in A Slitlike Pore: Grand Canonical Monte Carlo Simulation and Density Functional Theory Study. Journal of Physical Chemistry B, 110, 334-341. You, F., Fu, S., Yu, Y.-X., & Gao, G.-H. (2005). Density functional for structures of colloids confined in a slit-like pore. Particuology, 3(5), 265-270. You, F., Yu, Y.-X., & Gao, G.-H. (2005). Structure of Inhomogeneous Attractive and Repulsive Hard-Core Yukawa Fluid: Grand Canonical Monte Carlo Simulation and Density Functional Theory Study. Journal of Physical Chemistry B, 109, 3512–3518. You, F., Yu, Y.-X., & Gao, G.-H. (2005). Structures and adsorption of binary hard-core Yukawa mixtures in a slitlike pore: Grand canonical Monte Carlo simulation and density-functional study. Journal of Chemical Physics, 123, 114705. Yu, Y.-X., Wu, J.-Z., You, F., & Gao, G.-H. (2005). A Self-Consistent Theory for the Inter and Intramolecular Correlation Functions of a Hard-Sphere-Yukawa-Chain Fluids. Chinese Physics Letter, 22(1), 246-249. Gao, J., He, C., & You, F. (2016). Chapter 2: Shale Gas Process and Supply Chain Optimization. In P. Kopanos, P. Liu & M. Georgiadis (eds. ), Advances in Energy Systems Engineering (pp. 21-46), Springer. Yue, D., & You, F. (2016). Chapter 10: Biomass and Biofuel Supply Chain Modeling and Optimization. . In J. Holm-Nielsen & E. Ehimen (eds. ), Biomass Supply Chains for Bioenergy and Biorefining (pp. 149-166), Elsevier. Seay, J. & You, F. (2016). Chapter 5: Biomass Supply, Demand and Markets. In J. Holm-Nielsen & E. Ehimen (eds. ), Biomass Supply Chains for Bioenergy and Biorefining (pp. 85-100), Elsevier. Gong, J., & You, F. (2016). Life cycle biorefinery design. In M. Martín, (ed. ), Alternative Energy Sources and Technologies: Process Design and Operation (pp. 363-381), Springer. 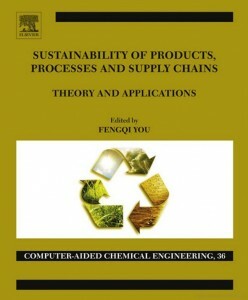 You, F. (2015) Sustainability of Products, Processes and Supply Chains: Theory and Applications. Elsevier. 628 pages. ISBN: 9780444634726. Park, J., Yue, D., & You, F. (2015). Chapter 12: Design and Planning of Sustainable Supply Chains for Biobased Products. In S. Snyder (ed. ), Commercializing BioBased Products (pp. 285-303), Royal Society of Chemistry (RSC). Guillén-Gosálbez, G., & You, F. (2014) Chapter 13: Plant location: Supply chain management. In M. Martín, (ed. ), Introduction to Software for Chemical Engineers (pp. 529-540), Florida:CRC Press, Taylor and Francis. You, F., & Grossmann, I.E. (2007). Optimal Design and Operational Planning of Responsive Process Supply Chains. In L. Papageorgiou & M. Georgiadis (eds. ), Process System Engineering: Volume 3: Supply Chain Optimization (pp. 107-134). Weinheim: Wiley-VCH. Shang, C., & You, F.* (2018). Chance Constrained Model Predictive Control via Active Uncertainty Set Learning and Calibration. Proceedings of the 57th IEEE Conference on Decision and Control (CDC), 2605-2610. Ning, C., & You, F.* (2018). A Transformation-Proximal Bundle Algorithm for Solving Multistage Adaptive Robust Optimization Problems. Proceedings of the 57th IEEE Conference on Decision and Control (CDC), 2439-2444. Guo, C., & You, F.* (2018). A Data-Driven Real-Time Irrigation Control Method Based on Model Predictive Control. Proceedings of the 57th IEEE Conference on Decision and Control (CDC), 2599-2604. Gong, J., & You, F.* (2018). Process Resilience Analysis and Enhancement using Nonlinear Adaptive Robust Optimization. Proceedings of the 2018 American Control Conference (ACC), 4869-4874. Ning, C., & You, F.* (2018). Data-Driven Adaptive Robust Optimization Framework Based on Principal Component Analysis for Process Network Planning. Proceedings of the 2018 American Control Conference (ACC), 3020-3025. Shang, C., & You, F.* (2018). Distributionally Robust Process Scheduling under Ambiguous Uncertainty. Proceedings of the 2018 American Control Conference (ACC), 5896-5901. Luo, N., & You, F.* (2018). Operational Optimization of Shale Gas Processing under Feedstock Uncertainties with Updated Back-off Strategy. Proceedings of the 2018 American Control Conference (ACC), 4837-4842. Ning, C., & You, F.* (2017). Leveraging Big Data for Adaptive Robust Optimization of Scheduling under Uncertainty. Proceedings of the 2017 American Control Conference (ACC), 3783-3788. Ning, C., & You, F.* (2016). Data-Driven Robust MILP Model for Scheduling of Multipurpose Batch Processes under Uncertainty. Proceedings of the 55th IEEE Conference on Decision and Control (CDC), 6180-6185. Gao, J., & You, F.* (2015). Stochastic Programming Approach to Optimal Design and Operations of Shale Gas Supply Chain under Uncertainty. Proceedings of the 54th IEEE Conference on Decision and Control (CDC), 6656-6661. Shi, H., & You, F.* (2015). Adaptive Surrogate-Based Algorithm for Integrated Scheduling and Dynamic Optimization of Sequential Batch Processes . Proceedings of the 54th IEEE Conference on Decision and Control (CDC), 7304-7309. Gong, J., & You, F.* (2015). An Efficient Global Optimization Algorithm for Mixed-Integer Nonlinear Fractional Programs with Separable Concave Terms. Proceedings of the 2015 American Control Conference (ACC), 547-552. Ye, W., & You, F.* (2015). A Fast Simulation-based Optimization Method for Inventory Control of General Supply Chain Networks under Uncertainty. Proceedings of the 2015 American Control Conference (ACC), 2001-2006. Yue, D., & You, F.* (2015). Bilevel Programming Approach for Manufacturing Supply Chain Optimization with Non-cooperative Suppliers and Customers. Proceedings of the 2015 American Control Conference (ACC), 3925-3930. Shi, H., & You, F.* (2015). Robust Optimization for Integrated Scheduling of Sequential Batch Processes with Dynamics. Proceedings of the 2015 American Control Conference (ACC), 4947-4952. Chu, Y., & You, F.* (2015). A Novel Solution Approach for Integrating Dynamic Optimization with Batch Process Operations. Proceedings of the 2015 American Control Conference (ACC), 5635-5640. Gao, J., & You, F.* (2015). Fast optimization algorithms for large-scale mixed-integer linear fractional programming problems. Proceedings of the 2015 American Control Conference (ACC), 5901-5906. Chu, Y., & You, F.* (2014). Agent-Based Simulation And Optimization For Multi-Echelon Inventory Systems Under Uncertainty. Proceedings of the Winter Simulation Conference (WSC), 376-384. Singh, A., Chu, Y., & You, F.* (2014). Agent-Based Simulation And Optimization For Multi-Echelon Inventory Systems Under Uncertainty. Proceedings of the Winter Simulation Conference (WSC), 385-394. Shi, H., Chu, Y., & You, F.* (2014). Integrated Planning, Scheduling, and Dynamic Optimization for Continuous Processes. Proceedings of the 53rd IEEE Conference on Decision and Control (CDC), 388-393. Chu, Y., & You, F.* (2014). Simulation-Based Method for Optimizing Multi-Echelon Inventory Systems. Proceedings of the 53rd IEEE Conference on Decision and Control (CDC), 1899-1904. Chu, Y., & You, F.* (2014). Integrated Planning and Scheduling by Hybrid Solution Method. Proceedings of the 53rd IEEE Conference on Decision and Control (CDC), 6818-6823. Gao, J., & You, F.* (2014). Optimization of Water Management in Shale Gas Production Process. Proceedings of the 53rd IEEE Conference on Decision and Control (CDC), 6807-6812. Chu, Y., & You, F.* (2014). Integrated Scheduling and Dynamic Optimization of Network Batch Processes. Proceedings of the 2014 American Control Conference (ACC), 5024-5029. Chu, Y., & You, F.*, & Wassick, J.M.(2014). Hybrid Agent-based Method for Scheduling of Complex Batch Processes. Proceedings of the 2014 American Control Conference (ACC), 940-945. Chu, Y., & You, F.* (2014). Integration of Scheduling and Dynamic Optimization of Batch Processes under Uncertainty. Proceedings of the 2014 American Control Conference (ACC), 4997-5002. Zhong, Z., & You, F.* (2014). Parametric Algorithms for Global Optimization of Mixed-Integer Fractional Programming Problems in Process Engineering. Proceedings of the 2014 American Control Conference (ACC), 3609-3614. Chu, Y., & You, F.* (2014). Moving-horizon Method for Integrating Scheduling and Control. Proceedings of the 2014 American Control Conference (ACC), 2948-2953. Chu, Y., & You, F.* (2013). Decomposition Method for Solving Integrated Problem of Cyclic Scheduling and PI Controller Design. Proceedings of the 2013 American Control Conference (ACC), 334-339. Chu, Y., & You, F.* (2013). Integration of Scheduling and Dynamic Optimization for Sequential Batch Processes. Proceedings of the 2013 American Control Conference (ACC), 3511-3516. Yue, D., & You, F.* (2013). Integration of Planning, Scheduling and Stochastic Inventory under Uncertainty for Flexible Process Networks. Proceedings of the 2013 American Control Conference (ACC), 3505-3510. Yue, D., & You, F.* (2013). A Reformulation-Linearization Method for the Global Optimization of Large-Scale Mixed-Integer Linear Fractional Programming Problems and Cyclic Scheduling Application. Proceedings of the 2013 American Control Conference (ACC), 3985-3990. Chu, Y., Wassick, J.M., & You, F.* (2012). Real-time Scheduling of Batch Processes via Multi-Agent Based Modeling. Proceedings of the 51st IEEE Conference on Decision and Control (CDC), 6370-6375. Gebreslassie, B.H., Yao, Y., & You, F.* (2012). Multiobjective Optimization of Hydrocarbon Biorefinery Supply Chain Designs under Uncertainty. Proceedings of the 51st IEEE Conference on Decision and Control (CDC), 5560-5565. Chu, Y. & You, F.* (2012). Online Integration of Scheduling and Control for Cyclic Production in CSTR. Proceedings of the 51st IEEE Conference on Decision and Control (CDC), 7007-7012. All documents on this page are provided to ensure timely dissemination of scholarly and technical work. Copyright and all rights therein are retained by the author(s) and the journals or conferences where they were published.